This 'baby' Transit is anything but a lightweight when it comes to meeting the demands of the small and compact van sectors. Jonathan Crouch looks at the revised model. 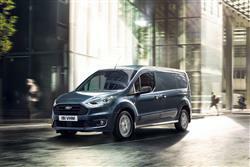 You don't buy any van prioritising ride and handling but with Ford's strong reputation in this department when it comes to passenger cars, then it's fair to expect this Transit Connect to dynamically, be one of the class leaders. Which broadly, it is. Like any LCV, this one handles better fully loaded, but even in the unladen state, cornering response is predictable and bodyroll well controlled. Once you've dropped off your load, you could even imagine rather enjoying yourself on the way home around the twisty stuff in one of these. To a point. Of course, to a certain extent, you'll be limited by the modest output of the new 1.5-litre EcoBlue diesel powerplant that most Transit Connect customers go for. There's also an improved 1.0 Ecooost petrol engine option. An upgraded six-speed manual transmission is now fitted to all engines as standard and the 1.5-litre EcoBlue engine can also be specified with an advanced new eight-speed automatic transmission, which has been engineered to deliver smooth, swift gearshifts. If you're towing, then the top diesel's the variant to choose, offering a braked trailer towing capacity of up to 800kg. Depending on the variant you choose, the turning circle is between 11 and 11.9m. There's plenty of hi-tech here as well. Safety-wise, the Electronic Stability Program (ESP) is standard across the entire range, plus there's Hill Launch Assist to stop you drifting backwards on uphill junctions, Anti Lock Brakes with Hydraulic Brake Assist, Active Yaw Control (that assists with oversteer and understeer), Roll Movement Intervention (to reduce body roll) and, if the worst comes to the worst, Roll Over Mitigation. Pricing starts at around £16,000 excluding VAT and there's a premium of around £1,000 to go from the 'L1' short wheelbase bodystyle to the 'L2' long wheelbase version. 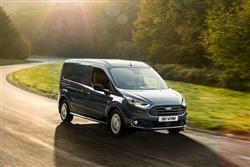 If you're looking to carry people as well as packages, there's a 'Double Cab-in-Van' option with a fold-out rear bench. Or you could go for a full Kombi version with proper rear seats. Trim levels run from 'Base' (where there's the option of a frugal 'ECOnetic version) to 'Trend' and on to 'Limited'. 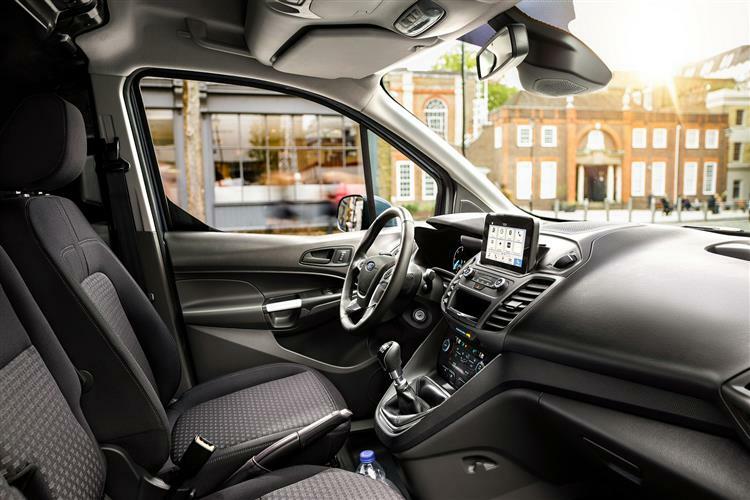 Whichever Transit Connect you choose, equipment levels run to a reach and rake-adjustable steering wheel, see-you-home lights that stay on at night to guide you to your front door, remote central locking that allows you to lock and unlock the cab and load area separately, Hill-Start Assist to stop you drifting backwards on uphill junctions, a full steel bulkhead and a sliding side door. There's also a DAB digital radio, a trip computer and steering wheel stereo controls. This revised model introduces a comprehensive range of segment-first driver assistance features, including an Intelligent Speed Limiter - that enables automatic adjustment of maximum vehicle speed to remain within legal limits. There's also a Pre-Collision Assist with Pedestrian Detection emergency braking system, Side Wind Stabilisation and Active Park Assist that helps to steer the vehicle into both parallel and perpendicular parking spaces. 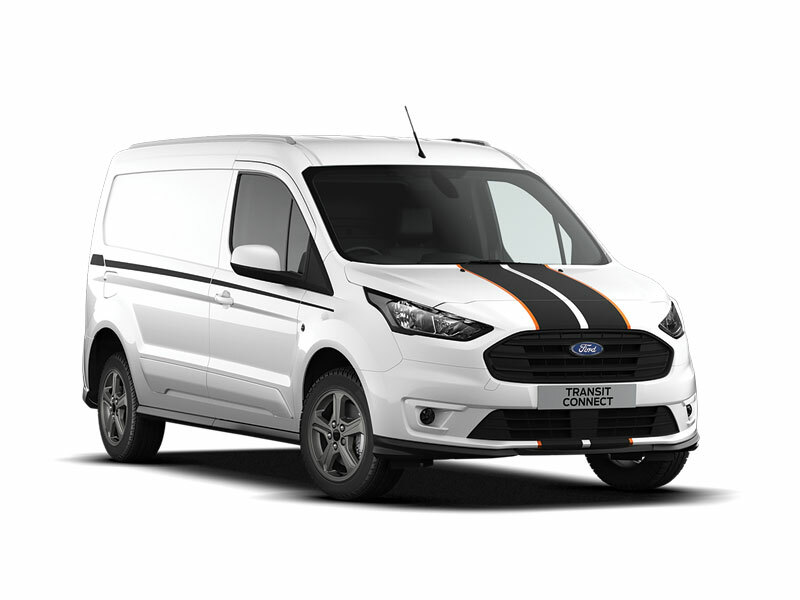 Transit Connect models come as standard with conventionally hinged side-opening twin rear doors that can be specified to swing through 250-degrees and latched against the vehicle's sides. There is the option of a hatchback-like single top-hinged rear door, but if you go for that, then you're going to have trouble getting a forklift close enough to the back of the vehicle to fully fill the space available. That said, the loading height can be as little as 598mm from the ground. Even bulky stuff should go in OK, even in the short wheelbase lowroof version which has a rear door aperture 1145mm high and 1293mm wide. Beyond that, there's a 2.9m3 space - or 3.6m3 if you specify the fold-flat front passenger seat. There's a loadspace length of 1739mm and a loadspace width of 1490mm, narrowing to 1226mm between the wheelarches, wide enough to take a Europallet. Oh and 1193mm of loadspace height. If you're planning to make use of all that capacity, then you'll want to know that the payload capacity can be as high as 1,000kgs. But, you know what it's like, there are always going to be occasions when all that won't be quite enough. And if one of those occurs, then you may wish you'd opted for the long wheelbase high roof model, a variant that's 25cm longer overall. Here, the rear door aperture height rises to 1316mm, while the total loadspace volume rises to 3.7m3 - or 4.4m if you specify the fold-flat front passenger seat. That's thanks to a loadspace height increase to 1364mm and a load length increase to 1986mm - which means that you could accommodate pipes of up to 3m long. Smaller loads of course can be loaded in through the sliding side door. One of these is standard, with a second on the options list. In the short wheelbase model, the sliding side door offers an aperture 606mm wide and 1040mm high, but on the longer long wheelbase variant, the width rises to 809mm and the height to 1181mm. To minimise overall cost of ownership, service intervals have been extended on both diesel and petrol variants, with manual diesel vehicles now offering best-in-class variable intervals of up to two years/25,000 miles. The longer service intervals contribute to scheduled maintenance and non-scheduled repair costs that are significantly lower than the primary competition, according to Ford analysis. 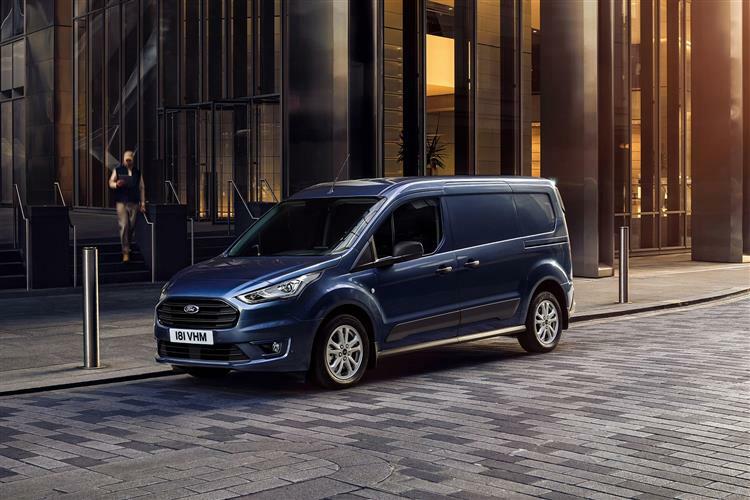 The latest version of the 1.0-litre EcoBoost engine incorporates significant changes to the cylinder head, fuel injection and emission-control systems to provide further improvements in fuel-efficiency. New technologies also include cylinder deactivation, which enables the engine to run on two cylinders at low loads, to reduce pumping losses and improve frugality. 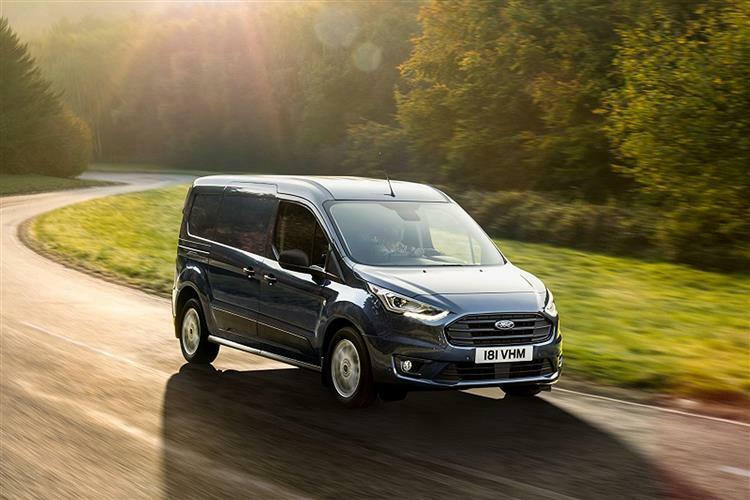 The improved Transit Connect remains a practical, no-nonsense, well-rounded package that still does a very effective job for Ford in appealing to business customers in both the small and not so small panel van sectors. The practicalities still stack up well against obvious rivals in both segments who clearly looked very carefully at what this model has to offer but in many respects, failed to improve upon it. It was just as well though, that the changes wrought upon this improved model were introduced. 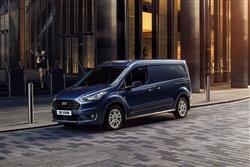 The introduction of a greener, more refined 1.5-litre EcoBlue diesel is welcome, as is the availability of an improved version of Ford's clever 1.0-litre EcoBoost petrol unit. With electric power in its future, this Connect will continue as an alternative that all small and compact van buyers need to consider. Tough, practical and ready for anything. Just as any Transit should be.